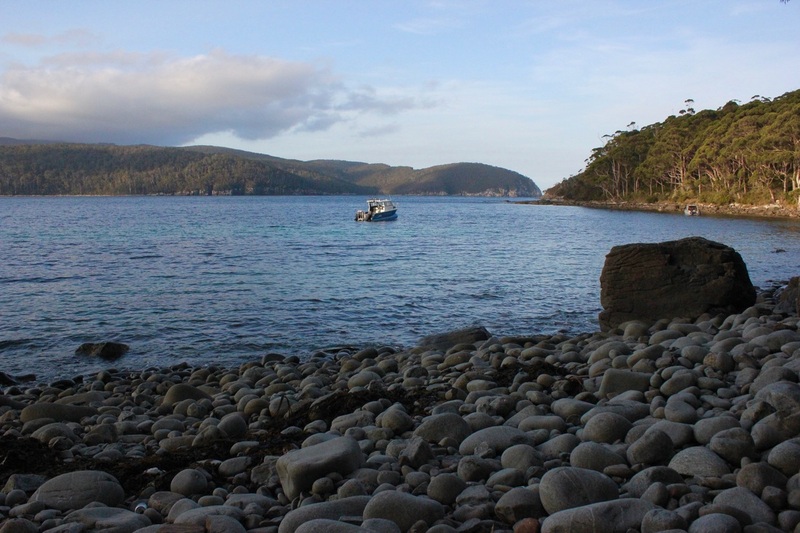 Fortescue Bay is in the Tasman National Park and is a great location for exploring the Tasman Peninsula. 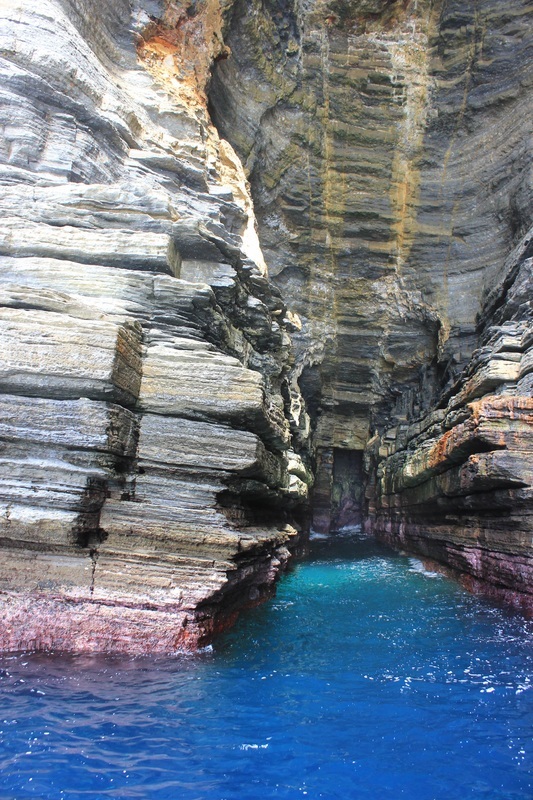 The Tasman National Park covers a large area of this Peninsula with spectacular coastline. The Park has a number of attractions to visit, such as Tasman Arch, Blowhole, Waterfall Bay, and Remarkable Cave areas, so you can easily spend a few days here, exploring and relaxing (we did both). 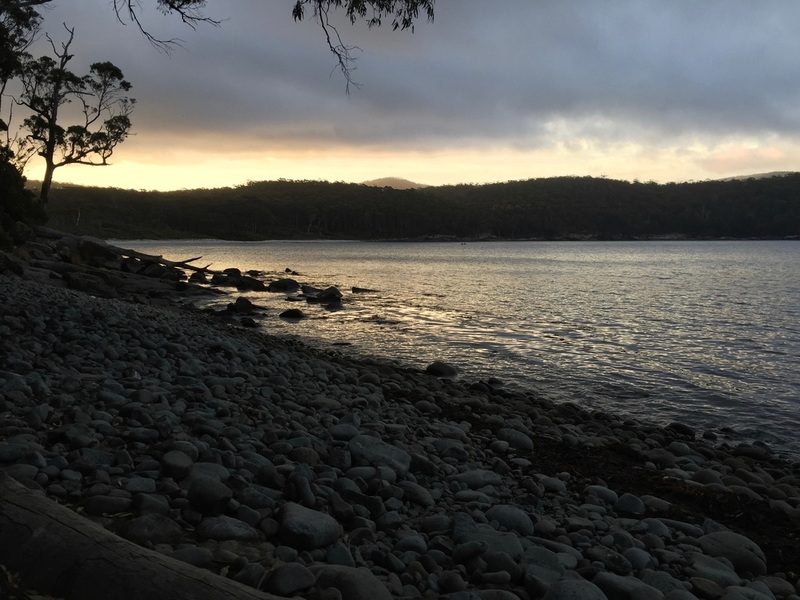 The Peninsula also has one of Tasmania's newest walking attractions, Three Capes Track which is supposed to be a stunning way to see this part of the world. Fortescue Bay is located in the southern end of the National Park. Getting there is easy - just follow the signs towards Port Arthur, along the A9. 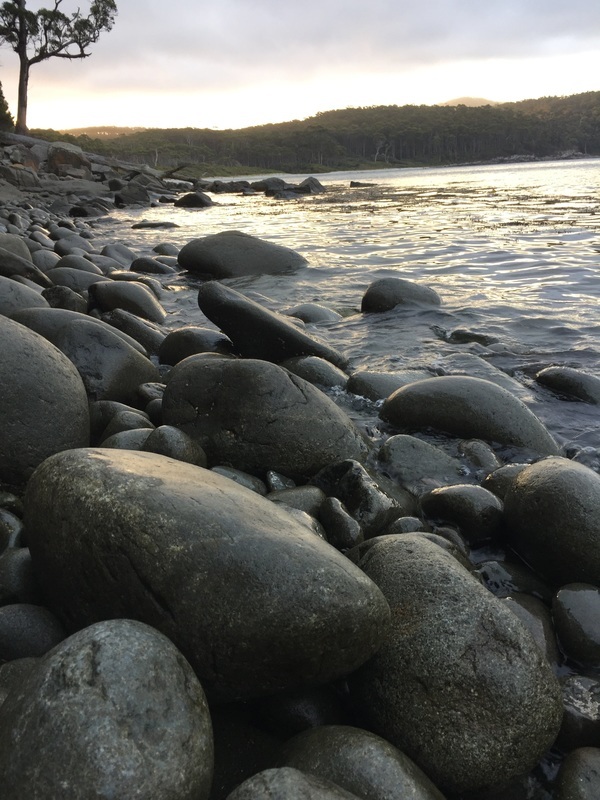 Access to Fortescue Bay and walking tracks can be reached along the Fortescue Rd, a 12km gravel road. This road is suitable for all vehicles. Its a pretty drive through to the campground, with dense bush either side of the road (so do watch for wildlife). There are signs clearly indicating your turn off towards this camping area. This campground is one where you can book in advance to secure your spot. In peak times it might be advisable but we took a chance and only rang a day prior to arrival, and managed to get a campsite during the busy January period. Mills Campground which is where you can drive your vehicle right to your campsite. 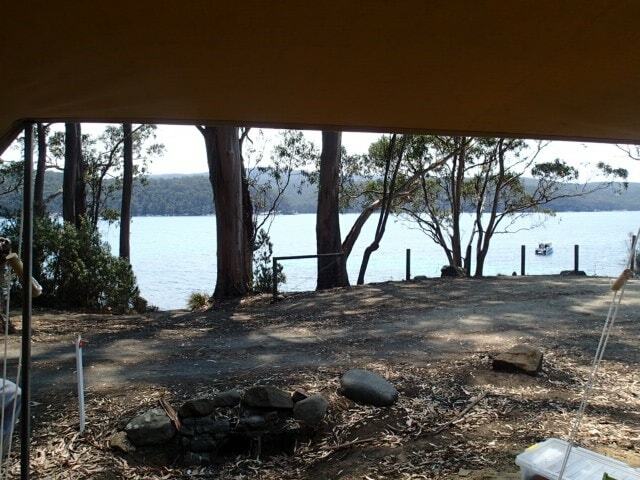 We chose to stay in the Mills Campground which was the busier of the two camping locations and has views of Fortescue Bay. The walk to the beach is about 400m. 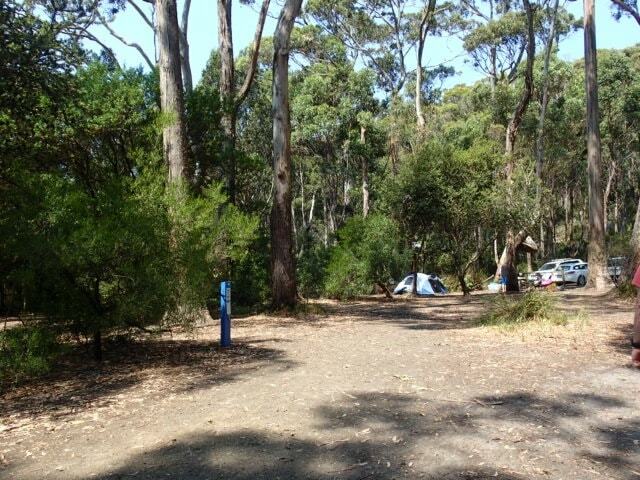 Banksia Campground has bollards around the camping area, which means you park your car, and carry your gear to the designated campsite. Not far in any cases we could see, and if you are the sort of person who travels light, or has lots of willing helpers, this is easy. There are a few sites allocated to vans and they were in that section, but I wasn't sure how they got in there! 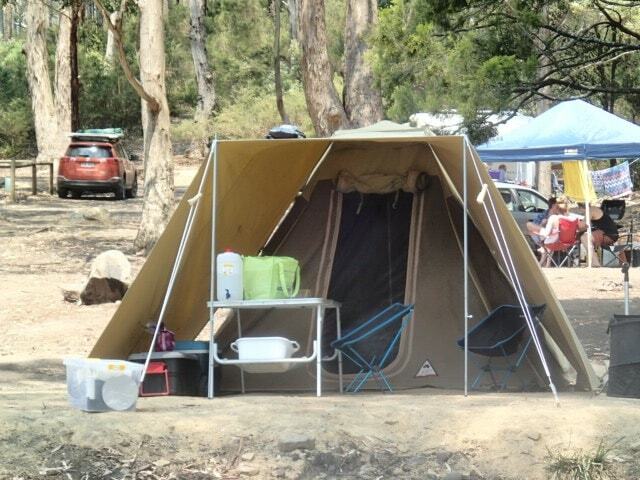 Banksia Campground does not have views of the Bay, but there is only a short distance to access the beach. Upon paying upon arrival at the caretaker office (which also sells ice and limited supplies), you will be advised of your campsite number. We have to admit that driving into Mills Campground was a little disappointing. It was very busy (to be expected in Dec/Jan) and there were lots of boat trailers in a parking section right in front of campsites, and lacked the charm of Mt Field camping or Cradle Mountain. Our campsite was right in front of the Bay (which was great) but next to the boat trailer parking (which was bad). There also was very little privacy between the sites, especially those with campsite numbers 36 - 40 : all of which are impacted by the boat trailer parking. These sites are the ones closest to Bay and do have the best views, though only campsite 39 would have unobstructed views eg. no other campers or vehicles in front of your campsite. Campsites 41-51 are not as affected by the trailer parking and seemed to have more privacy, but the higher the number of campsite, the further from the Bay you are. Keep that in mind if you are coming here for the views. 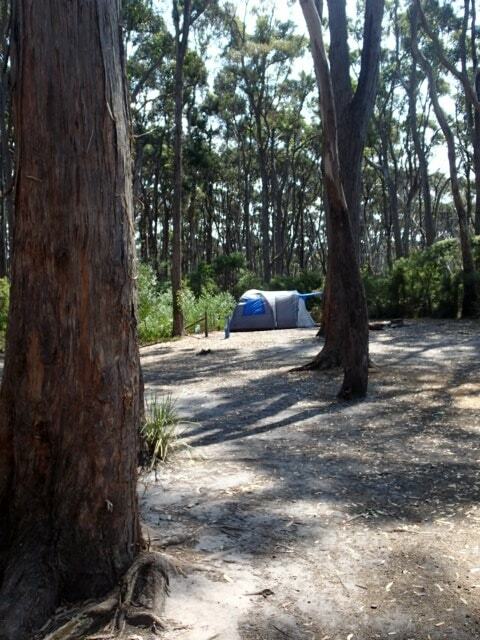 Mills Campground is designed for caravans and trailers, as well as tents and some sites which were designated for a caravan, would have been a nightmare to get into the site. I would recommend, if possible, before you pay for your site, check that you can actually park your vehicle into the spot they have allocated you. Some of the sites are small and not level and you could have issues getting your caravan/trailer suitably set up in the space allocated. Surrounding the campground, the area is very dense in vegetation, and it does provide shade and protection from the breeze. Being surrounded by forests and bush, you never forget you are in a National Park, and there are plenty of possums and pademelons to visit you! In saying all of the above, I must stress that once we set our campsite up, and positioned our tent and awning, our view was lovely, and having others around us didn't spoil our visit. It's just that it wasn't what we had expected. In fact, I ended up loving our campsite and just sitting back and looking at the Bay (yes, we were in campsite 39 so we didn't overlook other campers!). For some reason, we forgot to take many photos of this campground, so we only have the photos below to give you an idea of Mills Campground. This section of Fortescue Bay is primarily designed for those who are tent campers, but don't need to park right next to their vehicle. You have a short walk to your campsite, which is clearly indicated by a blue post with a number on it. This area was fairly empty on our first night, though it did fill up more so the next night (with a mix of hikers and families). 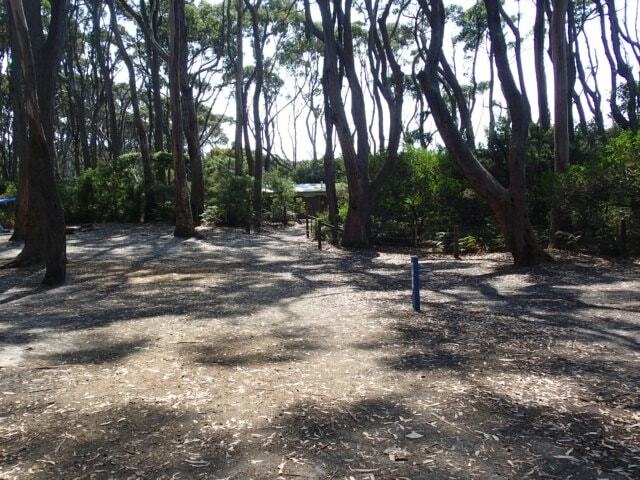 It is very well shaded, and the camping area surrounded by bushland. 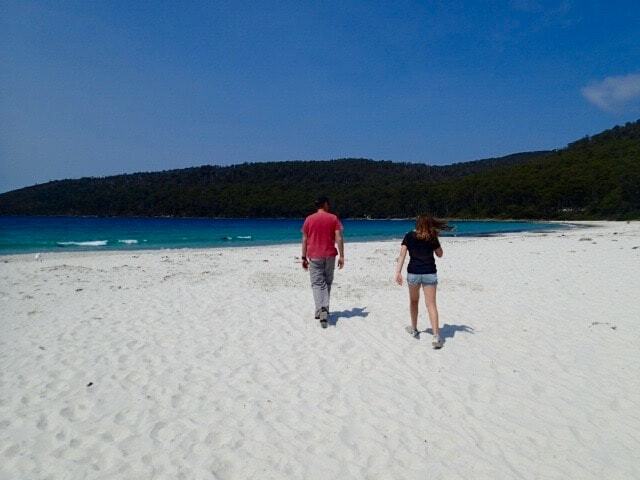 There are paths that take you directly to the beautiful beach, so access is very easy and very close. As mentioned before, some vehicles can access this camping section - we assume they must have received a key to open an access gate and then have it locked after them. We could see no way they could get in!! 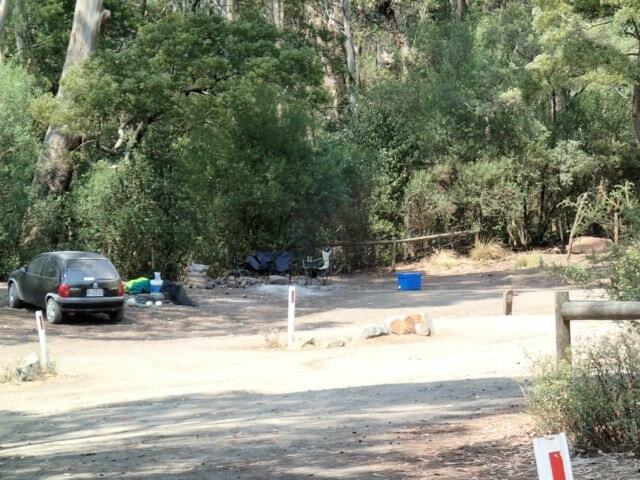 The campsites are fairly close to each other and I would have to say there is no screening at all amongst them. If you were camping in a group, this would be ideal way to all be together. 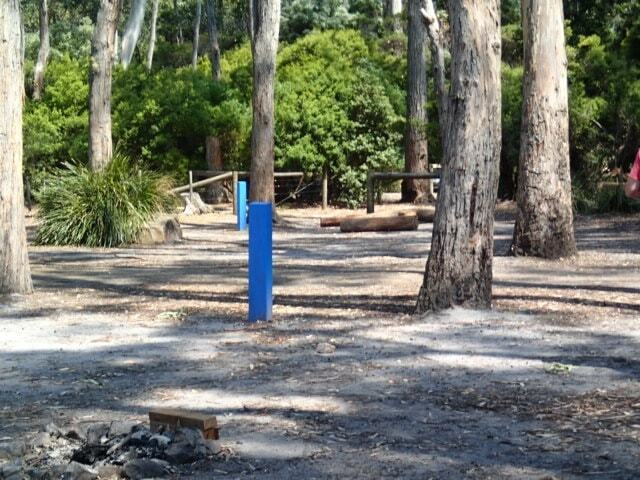 At Mills Campground there was a toilet block - 2 pit toilets for women, 2 pit toilets for men. They did not smell one bit! And they were getting a lot of use, but there were never any odours. There were no shower facilities in this part of the campground which was a bit surprising, as showers were advertised. If you want a shower, there was only one shower for the entire campground (both Mills and Banksia) and that was located in the Banksia toilet block. And there was a queue for it!!! You can purchase tokens for hot water at the reception area when you arrive ($2 for 4 minutes) which is a reasonable price. The only issue is finding time to actually have a shower so you can use them. The toilet blocks were cleaned daily and whatever they used on the floors to clean them made the whole area smell of marshmallows! Very nice smell. It was a weird smell but a good one. There are 2 electric BBQs in the day use area (which sits between the 2 campgrounds) and this area gets a lot of use during the day, and is a very popular spot for daytrippers. Only 1 BBQ was operational when we were there, so you might have to wait a little to cook your lunch/dinner. In the Mills Campground section there is a jetty and boat access (hence why there is boat trailer parking) - fishing must be good in this area because there were a lot of boats coming and going throughout the day, and that includes from 5am in the morning. Yes, if you are camping near the boat trailer parking, you can expect to have a constant procession of boats arriving and being put in the water from early morning, and its not exactly peaceful. On a positive note, the boat trailer section had cleared by evening, but daytrippers also used the boat trailer section to park, so it can be a busy area. Maybe this is only the case in holiday period??? Woodfires are allowed, and can be purchased from the caretaker office. We saw that some people had ordered it, and the caretaker delivered to their campsite! Some fireplaces are provided, others look like people have just made them wherever it suited. There is meant to be a rubbish collection facility in the day area section - we didn't find it so we ended up taking our rubbish with us to a town to dispose of. Next time, I will look harder for it. There is plenty to see and do in Fortescue Bay. Whether you plan on staying in the Park and doing the numerous walks (you don't need to sign up for the Three Capes Track - there are plenty of shorter day walks to take including walking along the beautiful beach. If the weather is warm enough you can swim there (it was the middle of summer, but the water was still icy!). We spent time just spending time clambering over the rocks near the campsite, and admiring the serenity of the view from a hammock on the beach. 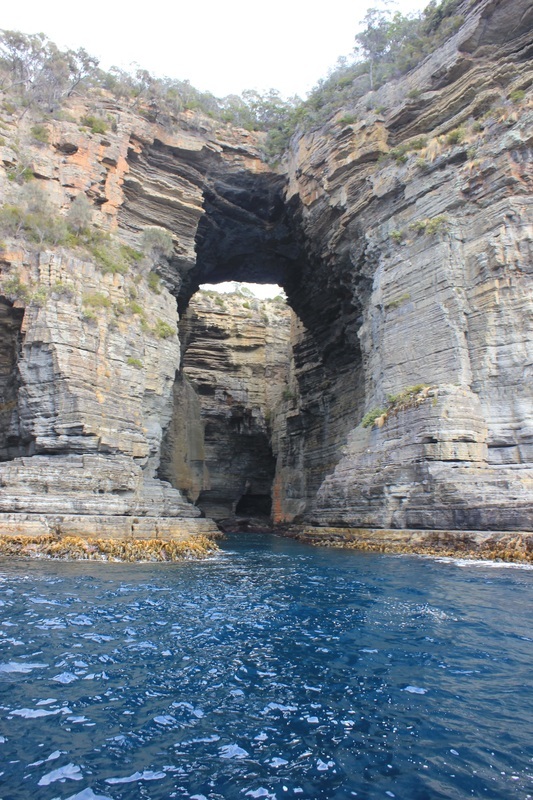 Day trips from Fortescue Bay can take you to the see the natural beauty of the coastline. Kayaking and canoeing seemed to be a popular activity amongst campers when we were there, and if you are equipped properly there is apparently lots to see from your canoe and kayak. To get more information on these activities, make sure you read the Parks & Wildlife Service website which has more detail. Port Arthur is very close and worthwhile if you haven't been. You can find out about costs etc at the Port Arthur website. 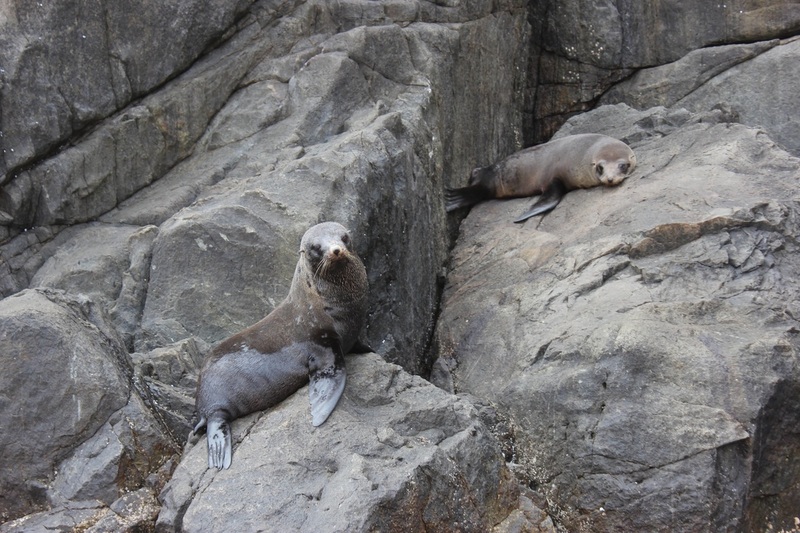 But if there is one activity that I would wholeheartedly recommend if you are staying in this area for the first time (or only time you will be here) and that is to do the Tasman Island Cruise. 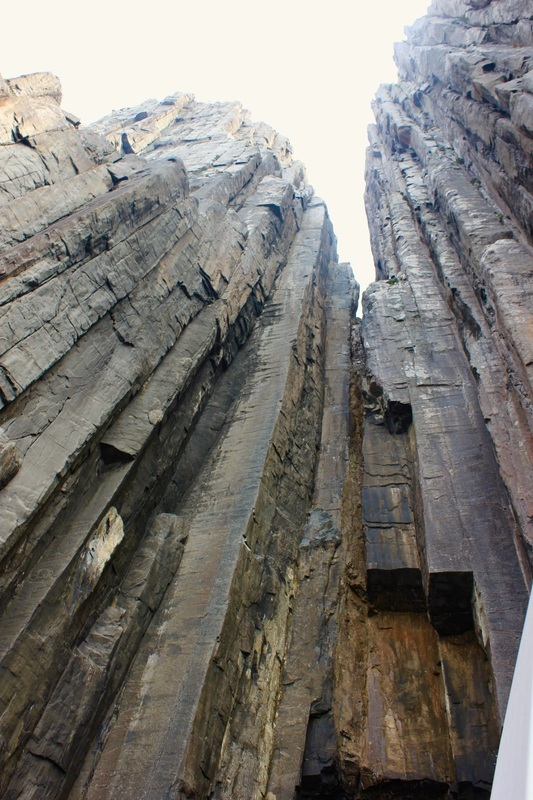 It's a 3 hour cruise that takes you around the coastline to get a different perspective of the majesty of this area, which is impossible to see unless you are in a boat. We recommend this trip so highly. It's not cheap, but everyone in our family loved it! Below is a video which will give you a far better understanding of what to expect. Initially, we didn't love this campground. I think it just wasn't what we had expected, and we were put off by the crowds, and the lack of privacy at the campsite (having boat trailers coming and going right next to us from early morning till dusk was not making the area tranquil). But by the end of our stay, the beauty of this area had won us over (including my teenage son who only really likes true bush camping sites). We had to readjust our perceptions and remember we were travelling in peak season, where everywhere is busy. Once our campsite was sorted out, and the daytrippers had gone home, sitting outside our tent was very relaxing. 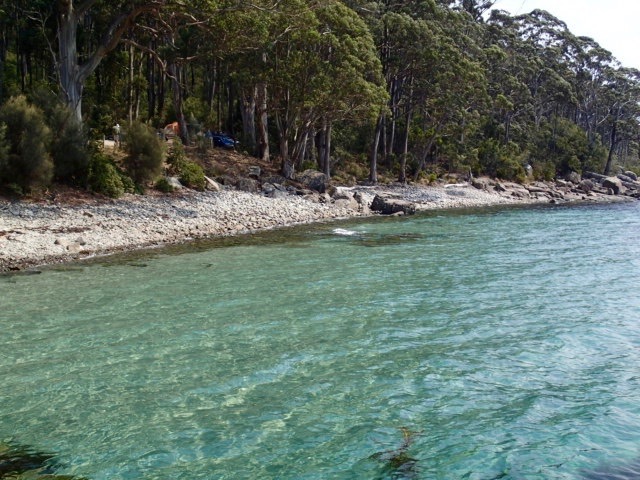 Additionally, travelling outside of the campground and seeing the Capes, caves, rock formations and cliffs from the Tasman Island Cruise also made us appreciate how wonderful this part of Tasmania is, and coming back to gaze upon Fortescue Bay was special. Would we visit here again? Yes. I would love to come back not in peak season and explore further. I think this area has a lot to offer. 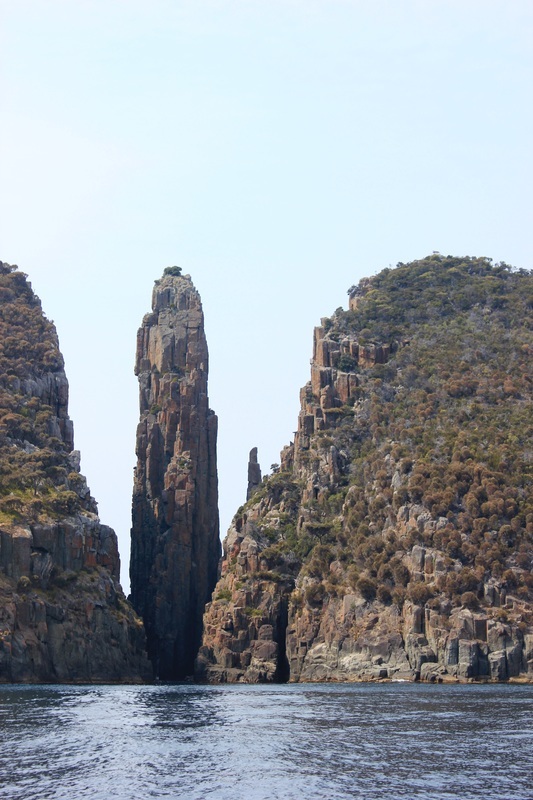 And a few shots taken from the Tasman Island Cruise to give you an idea of what you can see in this part of Tasmania.